Background and objectives Acute kidney injury (AKI) in hospitalized children results in increased patient morbidity and mortality. Nephrotoxic-medication exposure is a common cause of AKI. Currently, no data exist to quantify the risks of developing AKI for various nephrotoxic medications in children. The primary aim of the current study is to assess for a potential association between nephrotoxic medications and the risk of developing AKI in hospitalized noncritically ill children with no pre-existing renal insufficiency. Design, setting, participants, & measurements We performed a retrospective case-control study in pediatric hospitalized noncritically ill patients aged 1 day to 18 years. The cases were patients who developed AKI, as defined by the pediatric modified RIFLE (pRIFLE) criteria; patients without AKI served as controls and were matched by age category, gender, and disease state. Results 561/1660 (33.8%) patients identified for inclusion had AKI (441 category “R,” 117 category “I,” three category “F”); 357 cases were matched with 357 controls. Patients with AKI had longer length of hospital stay and increased hospital costs. Patients with AKI had exposure to more nephrotoxic medications for a longer period of time compared with controls. Odds of exposure for at least one nephrotoxic medication was significant for development of AKI. Exposure to more nephrotoxic medications was associated with an increased risk of AKI. Conclusions Increasing exposure to three or more nephrotoxic medications places pediatric patients at greater risk of acute kidney injury with resultant increased hospital costs and patient morbidity. Acute kidney injury (AKI) in children can be a devastating event and is independently associated with poor patient outcomes (1–5). Additionally, long-term follow-up of pediatric patients who have sustained an AKI episode demonstrate significant renal sequelae (6). The epidemiology of pediatric AKI is changing, with AKI secondary to another systemic illness or its treatment supplanting primary renal diseases in prevalence (7). Importantly, nephrotoxic-medication exposure is becoming more prevalent as a primary cause of AKI, comprising approximately 16% of all pediatric inpatient causes of AKI (1,5,7–10). However, both the risk of developing AKI when any nephrotoxic medication is initiated and the additive risk of AKI development with multiple nephrotoxic medications are unknown. Health outcomes of pediatric patients may be improved by identifying patients at risk for medication-associated AKI. Monitoring strategies and medication selection may need to be altered to prevent poor outcomes or minimize risk caused by nephrotoxic medications. The primary aim of the current study is to assess for a potential association between nephrotoxic medications and the risk of developing AKI in hospitalized noncritically ill children with no pre-existing renal insufficiency. Our secondary aims are to identify the specific types of nephrotoxic medications associated with a high risk of developing AKI and to ascertain whether multiple exposures to nephrotoxic medications result in additive or multiplicative effects on the risk of AKI in hospitalized pediatric patients. We performed a retrospective case-control study to determine the odds of nephrotoxic-medication exposure in noncritically ill children with no pre-existing renal insufficiency who developed AKI at Texas Children's Hospital during 2008. The Baylor College of Medicine Institutional Review Board approved the study before data collection and waived the need for informed patient consent, given the retrospective study design. Patients were included if (1) they were ≤18 years of age and admitted to a nonintensive care unit at Texas Children's Hospital for more than 3 days during the year 2008. and (2) they had at least two serum samples for creatinine (SCr) measurement drawn ≤4 days apart during their admission (mean ≥ 0.25 SCr values drawn per admission day). Patients were excluded if they were ever admitted or transferred to an intensive care area during their hospital stay, because the etiology for AKI would likely be multifactorial (i.e. hypotension) and difficult to attribute solely to nephrotoxic medications. Additionally, patients were excluded if they were admitted to the renal service or had an admission diagnosis of chronic kidney disease, end stage renal disease, renal transplantation, urinary tract infection, or pyelonephritis, because these indications for admission could place these patients at a higher risk of AKI. The data were abstracted from pharmacy, laboratory, and administrative databases. The initial list of nephrotoxic medications included was based upon the formulary of approved medications at our institution and included any medication with reported nephrotoxicity, defined as functional kidney impairment, from a standard drug information reference (11). Furosemide was not included in the list, because of its frequent use in the treatment of AKI to promote diuresis; therefore, discerning the role of furosemide in the development of AKI would be difficult. “Medication exposure” was defined as the number of different medications that study subjects received as inpatients. “Medication doses” was defined as the number of doses study subjects received from all medication exposures. “Days of medication therapy” was defined as the number of days that a study subject received a medication and was cumulative for each medication exposure (i.e. a study subject who received three medications, each for 7 days, had a 21-day total length of therapy). “Medication-exposure intensity” was defined as the number of concomitant medication exposures for a study subject (i.e. a study subject who received three medications simultaneously would have an intensity of 3, whereas a study subject who received three medications sequentially, with no overlap, would have an intensity of 1). “Doses per therapy day” was defined as the number of medication doses divided by the days of medication therapy. “Medication doses per admission day” was defined as the number of medication doses divided by the patient length of hospital stay. Estimated creatinine clearance (eCCl) was calculated according to the Schwartz equation (12) (Table 1). The pediatric modified Risk, Injury, Failure, Loss, End Stage (pRIFLE) criteria were used to determine AKI (13). Because urine output was not consistently available, eCCl was used for ascertainment of pRIFLE category (4,8,13,14). Cases were defined as patients who developed any degree of AKI as defined by pRIFLE criteria, and controls were defined as patients who did not develop AKI. Controls were matched to patients in a 1:1 fashion on the basis of age category, gender, and primary disease status upon admission and were matched before ascertainment of medication exposure. If more than one control met matching criteria for a case, the control subject with the nearest admission date to the case was selected. A sample size of 350 case-control pairs (700 patients) was estimated a priori to detect a nephrotoxic-medication exposure odds ratio of 1.5, with a power of 80% and an α of 0.05. This calculation was based on the assumption of the study population having 60% exposure to a medication. Demographic variables were summarized using descriptive statistics. Differences between patients without AKI and patients with AKI were performed using t test for parametric data, Mann-Whitney U test for nonparametric data, and χ2 analysis. A univariate analysis with conditional logistic regression was used in a stepwise manner to identify single medications associated with AKI with a P value of ≤0.25. For univariate and multivariate conditional logistic regression analysis, categories I and F were combined because there was only one patient in category F. Patient age, medication exposure, medication doses, days of medication therapy, medication-exposure intensity, baseline eCCl, and length of stay was analyzed in a stepwise fashion. The variables with a P value of ≤0.25 were included in a final multivariate conditional logistic regression model with interaction analysis. Positive and negative predictive values for development of AKI were calculated for increasing nephrotoxic-medication exposure and increasing nephrotoxic medication-exposure intensity, based upon the prevalence determined from the study population who met inclusion and exclusion criteria. All of the data analysis was conducted using Stata IC v.10 (StataCorp, College Station, TX). A total of 5437 patient admissions were identified during the study period. Of these, 1660 patients met study criteria, and 561 patients (33.8%) were categorized as having AKI (441 category R, 117 category I, and three category F). No patient died. From the 1660 patients, 357 case-control pairs (714 patients) were identified, and 363 subjects were male (50.8%). The case-control data set was not statistically different from the source population (n = 1660) in median length of stay, mean baseline eCCl, gender, or ethnicity (P > 0.05). The case-control data set was statistically different from the source population with regard to mean age (7.2 ± 5.5 years versus 8.8 ± 6.0 years, P < 0.05). Eighty-six percent of the case-control population (with and without AKI, n = 714) was exposed to one or more of 36 nephrotoxic medications. Patients received a median 2 (range, 0 to 8) nephrotoxic-medication exposures, for a median 9 (range, 0 to 271 days) days of nephrotoxic-medication therapy, and a median 18 (0 to 562) nephrotoxic-medication doses. Median nephrotoxic medication-exposure intensity was two concomitant nephrotoxic medications (range, 0 to 7) for the case-control (n = 714) study population. Patients with AKI had a longer length of hospital stay and a subsequently higher cost of hospital stay. Additionally, patients with AKI had a higher baseline eCCl, lower minimum eCCl, and higher maximum eCCl (Table 2). Patients with AKI had a greater number of median nephrotoxic-medication exposures, nephrotoxic-medication doses, days of nephrotoxic-medication therapy, and nephrotoxic medication-exposure intensity than patients without AKI (Table 2). Patients with AKI were exposed more often to seven different nephrotoxic medications (P < 0.05) (Table 3). Patients with AKI had significantly greater odds of exposure to one or more nephrotoxic medications than patients without AKI (odds ratio, 1.7; 95% confidence interval, 1.04 to 2.9; P = 0.03). 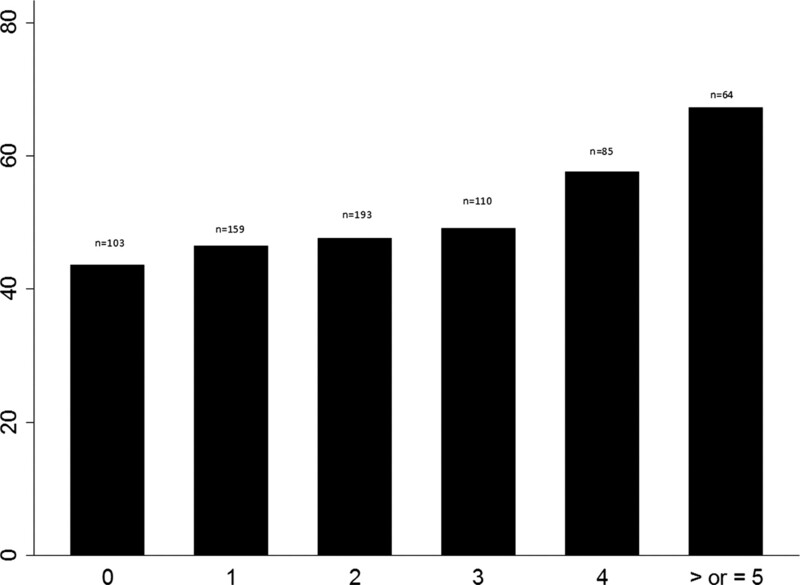 Both increasing nephrotoxic-medication exposure and nephrotoxic medication-exposure intensity were associated with improved predictability for development of AKI (Table 4). For patients with categories I and F combined, the positive predictive value nearly doubled when nephrotoxic-medication exposure or nephrotoxic medication-exposure intensity increased from 2 to 3. The percentage of patients developing AKI increased with increasing nephrotoxic-medication exposure (Figures 1 and 2). Percentage of patients who developed AKI by total nephrotoxic-medication exposure. The x axis indicates the number of nephrotoxic-medication exposures, and the y axis indicates percentage of patients with AKI. n, study population with number of medication exposures. 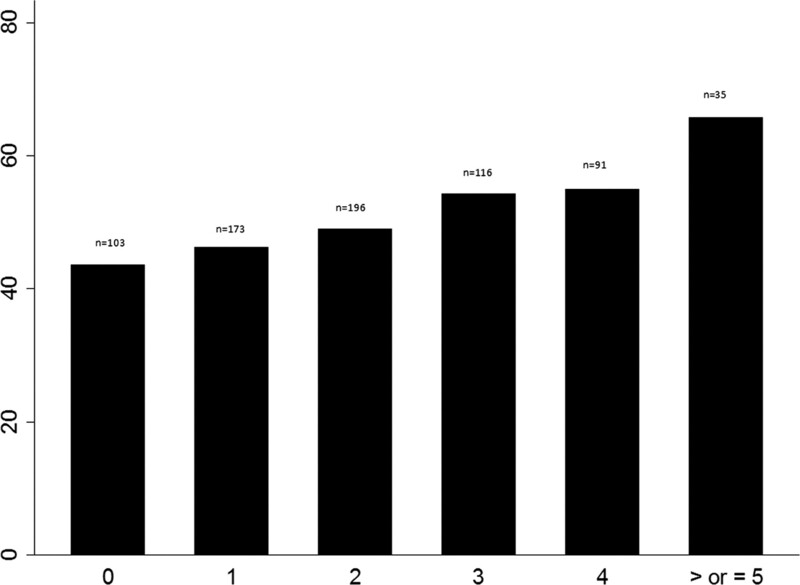 Percentage of patients who developed AKI by intensity of nephrotoxic-medication exposure. The x axis indicates the intensity of nephrotoxic-medication exposures, and the y axis indicates the percentage of patients with AKI. n, study population with number of medication exposures. Significant patient-related factors (P < 0.05) on univariate conditional logistic regression analysis for development of AKI included: age, SCr values per admit day, baseline eCCl, nephrotoxic-medication doses, nephrotoxic medication-exposure intensity, and days of nephrotoxic-medication therapy. Significant nephrotoxic medications on univariate conditional logistic regression analysis included amphotericin, cefotaxime, cisplatin, ifosfamide, piperacillin with or without tazobactam, and vancomycin. A multivariate conditional logistic regression model was developed for any degree of AKI, pRIFLE category R and pRIFLE categories I and F combined (Table 5). Age was noted as protective, and a statistically significant (P < 0.05) interaction was noted for any degree of AKI with ceftazidime and vancomycin. No interactions were noted for pRIFLE catergories I and F combined. We undertook a comprehensive assessment of nephrotoxic-medication–associated AKI in noncritically ill children. Previous reports have noted that nephrotoxic medications are an increasingly common etiology of AKI in hospitalized pediatric patients (5,7,10). We were surprised to find that the vast majority (>80%) of the study population, with or without AKI, was exposed to at least one nephrotoxic medication, and the number of different nephrotoxic medications to which patients were exposed was also very high (Table 3). Thus we suggest that our findings reflect a change in AKI epidemiology seen previously at our center (7). Interestingly, a very small number of patients developed the pRIFLE F category of AKI in our study cohort. We speculate that patients with pRIFLE F were most likely transferred to an intensive care unit, which would have excluded them from our data set. Previous literature has documented that patients with pRIFLE F are often more severely ill and would thus possibly necessitate intensive care unit admission (13). Another interesting finding was the high rate (33.8%) of AKI in a noncritically ill population using pRIFLE criteria. Most previous studies of pRIFLE were conducted in critically ill population, with observed AKI rates between 10 and 82%, depending on the specific population studied (all ICU admissions versus patients receiving invasive mechanical ventilation and a vasoactive medication (4,13,15). We speculate that the rates we observed that were higher than in some in the critically ill population result from our study design where we ensured that patients had at least two measured SCr values available for assessing change in eCCl, whereas the previous studies used an estimated baseline SCr at the upper end of the normal range. In such situations, patients admitted with mildly elevated SCr levels or who had true baseline SCr lower than the upper range of normal that did not increase further may have had undetected AKI, leading to lower reported rates. Patients with AKI had increased odds of exposure to at least one nephrotoxic medication compared with patients without AKI. However, few individual nephrotoxic medications were noted as statistically significant for development of AKI on multivariate analysis (Table 5). Many of the medications chosen for this evaluation have a very low reported incidence of nephrotoxicity. These medications were included because of the lack of pediatric data available on their true incidence on nephrotoxicity. Additionally, synergistic nephrotoxic effects may be present when multiple nephrotoxic medications are administered but are not noticed with single agent use. Medications such as piperacillin and vancomycin do not have a high incidence of nephrotoxicity associated with their use, particularly because manufacturing methods for vancomycin have improved and eliminated impurities but were identified as associated with AKI on multivariate analysis. This result is likely because of their use with other nephrotoxic medications and not the nephrotoxic potential of these individual medications (16). As nephrotoxic-medication exposure and intensity increases, the percentage of patients who developed AKI increased (Figures 1 and 2). Clinically, this may be due to various drug-related mechanisms for nephrotoxicity acting in a synergistic manner (10,17). Increasing total nephrotoxic-medication exposure and increasing intensity of exposure also increases predictive values for development of AKI (Table 4). For patients with category I and F combined, the positive predictive value nearly doubled from two to three medication exposures, for both total exposure and intensity of exposure. Patients with three or more nephrotoxic-medication exposures may be at a greater risk of development of pRIFLE category I or F than those with lower levels of exposure. The identification of statistically significant interactions also lends support to the hypothesis that individual medication exposure may not be as significant as multiple medication exposures. Interactions were only evaluated on a 1:1 basis for practical reasons, but further interactions may be present if multiple simultaneous interactions are evaluated. Identification of patients with exposure to multiple nephrotoxic medications may be useful for early intervention to prevent AKI. Increasing age was noted as a protective factor, and infants may be at higher risk for development of AKI after exposure to nephrotoxic medications (7). It should be noted that patients with AKI had a higher baseline eCCl than patients without AKI. This is contrary to reports in adult populations that have noted low baseline eCCl as an independent risk factor for aminoglycoside toxicity in the intensive care unit (1). Because pRIFLE criteria are based on the percentage of change in eCCl, patients, such as infants, who had a higher baseline also, had lower serum creatinine values. A small increase in serum creatinine from a very low baseline value may account for large changes in eCCl. Small changes in serum creatinine have been shown to affect morbidity and mortality, but these changes have been documented as 0.3 mg/dl or greater. Smaller increases in younger patients (0.1 to 0.2 mg/dl), which could result in significant (50%) changes in eCCl and pRIFLE category, are possible. This insensitivity of the serum creatinine value in young patients may account for the young age of patients who developed AKI. Patients with AKI had an increased length of stay in our data set. Increased time of exposure to nephrotoxic medications, secondary to an increased length of stay, may increase the risk of developing AKI, and AKI has been independently associated with morbidity and mortality in various pediatric populations (3,8,13). However, confounding by indication may have influenced this result. The majority of the medications to which patients were exposed were antimicrobial agents (52%), and patients would not receive these medications unless they were receiving treatment or prophylaxis for an infectious disease, which could increase length of stay and hospital cost. The limitations associated with retrospective review are present with this study, including accurate documentation of events and sources of bias. Information bias should be minimal in this patient subset, because study subjects who had AKI (cases) were matched to subjects without AKI (controls) before determination of medication exposure. However, we were not able to individualize patient-specific data in terms of their disease severity or chronicity. Given that children with chronic disease of a greater severity and longevity may have had multiple previous nephrotoxic insults (both medication and nonmedication related), we cannot exclude the presence of these potential biases in our analyses. Attempts were made to minimize selection bias by only including patients who had a certain number of SCr values measured. However, patients with nephrotoxic-medication exposure may have been more likely to have had a serum creatinine evaluated, which was one of the inclusion criteria, therefore skewing our population to those patients who had a high incidence of nephrotoxic-medication exposure. Patient care providers also may have had knowledge, unavailable to the investigators, that patients were at a greater risk for AKI, such as patients that were particularly small or patients that were young and therefore would have had a SCr value checked more often. These sources of bias do not appear to be clinically significant. The average difference between the case and control groups was approximately one serum creatinine value per 10 days of admission. Additionally, the case-control cohort appears to be representative of the patient population in general at our institution, because the differences in the nonmatched patient set did not appear to be clinically significantly different than the matched patient cohort. However, it is important to note that in a patient cohort with greater than 80% exposure to one or more nephrotoxic medications, most patients were not monitored for AKI on a daily basis. Increased monitoring may have captured a higher incidence of AKI in this patient subset. These limitations could be resolved with a standardized approach to monitoring of pediatric patients receiving medications that could precipitate AKI. As with most case-control studies, matching is a difficult process, and patients were unable to be matched on exact age but had to be matched by age category. Although there could be a significant difference in age within categories, this is likely not clinically significant in regards to kidney function (9,7,12). Other limitations to this study include confounding by indication, the inability to match patients on severity of illness, and the assumption that appropriate adjustments were made to medications with serum concentration monitoring. The effects of medications on other forms of nephrotoxicity, such as hematuria, proteinuria, or tubular transport dysfunction resulting in acidosis were also not evaluated and could represent a significant source of medication-associated AKI. Although the effects of disease status could be minimized by using the case-control study design and using selection criteria to eliminate patients with kidney disease, they cannot absolutely be ruled out as a factor that may precipitate AKI. Future directions should include patients with baseline kidney dysfunction and analysis of intensive care unit patients, because both of these subsets were excluded from this analysis. We suggest that our data support a practice of standardized monitoring of serum creatinine to detect AKI earlier in patients receiving three or four nephrotoxic medications, potentially allowing for more expeditious dose adjustment and decreased length of hospitalization. In addition, a prospective evaluation to validate the findings in this study and to determine specific criteria that place patients at risk of developing AKI is a necessary future undertaking. The assistance of E. O'Brien Smith with statistical analysis is acknowledged. The assistance of Carolyn Smith in querying data from the administrative database is acknowledged.